Simo "Simuna" Häyhä (December 17, 1905 – April 1, 2002), nicknamed "White Death" by the Red Army, was a Finnish marksman. Using a Finnish M/28-30 rifle (a Finnish variant of the Mosin–Nagant rifle) in the Winter War, he is reported as having killed 505 men, the highest recorded number of confirmed sniper kills in any major war. During the Winter War (1939–1940) between Finland and the Soviet Union, Häyhä served as a sniper for the Finnish Army against the Red Army in the 6th Company of JR 34 during the Battle of Kollaa in temperatures between −40 °C (−40 °F) and −20 °C (−4 °F), dressed completely in white camouflage. Stalin’s purges of military experts caused chaos, and Soviet troops were not issued with white camouflage suits for most of the war, making them easily visible to snipers. 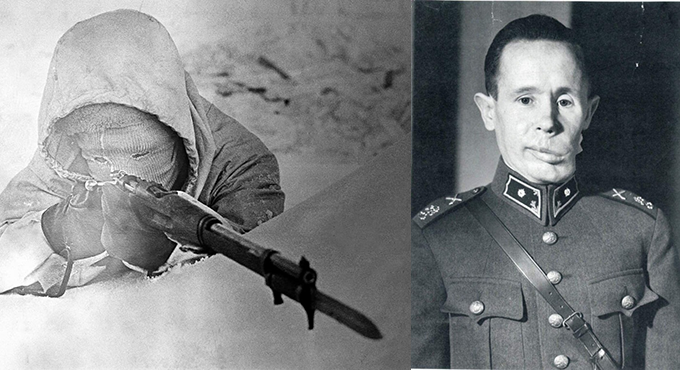 Häyhä has been credited with 505 sniper kills. A daily account of the kills at Kollaa was made for the Finnish snipers. All of Häyhä's kills were accomplished in fewer than 100 days – an average of just over five kills per day – at a time of year with very few daylight hours. Häyhä used an M/28-30, with serial number 60974, since it suited his small frame (1.6 m (5 ft 3 in). He preferred iron sights over telescopic sights as to present a smaller target for the enemy (a sniper must raise his head higher when using a telescopic sight), to increase accuracy (a telescopic sight's glass can fog up easily in cold weather), and to aid in concealment (sunlight glare in telescopic sight lenses can reveal a sniper's position). As well as these tactics, he frequently packed dense mounds of snow in front of his position to conceal himself, provide padding for his rifle and reduce the characteristic puff of snow stirred up by the muzzle blast. He was also known to keep snow in his mouth whilst sniping, to prevent steamy breaths giving away his position in the cold air.